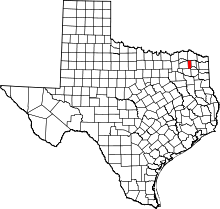 This is a list of the National Register of Historic Places listings in Franklin County, Texas. This is intended to be a complete list of properties listed on the National Register of Historic Places in Franklin County, Texas. There are four properties listed on the National Register in the county. One property is a State Antiquities Landmark while the other is a Recorded Texas Historic Landmark. (#100002840) 103 N Kaufman St.
(#05001542) 200 N Kaufman St. This page was last edited on 30 November 2018, at 15:32 (UTC).